A wrongful death or serious injury can occur when a property owns fails to properly maintain their premises. A landowner has a duty for the safe upkeep of the property and is responsible for death or injury caused when they fail to fulfill their duty in maintaining the property. The Law Office of Roger P. Foley, P.A. can assist you in bringing an action against these negligent parties when you or a loved one is injured in this manner. Our Law Firm will investigate your case based on the negligence of the premises owner coupled with your injury, your medical bills, future medical expenses, lost wages, future wages, pain and suffering and make a demand based on the available insurance coverage of the property and of the assets of the owner. When you are injured due to this type of negligence we will work diligently to reach a monetary settlement on your behalf. If we cannot reach a monetary settlement then we will proceed to trial. Our goal is to acquire the best result possible in your case by acquiring financial compensation for your injury. 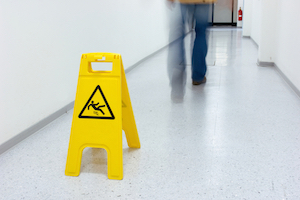 Slip and Fall Accidents can occur almost anywhere, however commercial properties and businesses are where most tort claims arise. When you are in a grocery store and another shopper drops a gallon of milk as you are walking by and then you slip and fall there probably is no negligence on the supermarket, however if a fellow shopper drops milk on the floor and two hours later nobody from the store has cleaned and dried the area and you fall, then there would be a claim against the supermarket for negligently failing to provide a safe environment. If you were walking through a local retail store at the mall and the roof collapsed onto you causing a serious back and spine injury then you would likely have a claim because the owner of the mall knew or should have known that the roof had a problem and failed to do basic maintenance and keep potential guests safe. Owners of commercial and private property have a duty to guests to provide a safe environment. Whether you were injured on private or commercial property you were owed a certain level of protection by the owners and if they breached that duty then you will likely have a claim. For instance, you go to visit your neighbor and you are entering the property through the main gate and the gate has a sharp piece of metal protruding out that you don’t see and it causes you an eye injury. You may think I was seriously injured and I lost vision in my right eye but I do not want to sue a friend. Your friend most likely has property insurance ( Homeowners insurance) that will help pay for medical bills and reimburse you financially for your loss. You cannot regain your vision so our premise liability lawyers will file a claim on your behalf. If you have been injured as a result of a negligent party failing to maintain their premises, contact our office immediately for a free case evaluation.